Josh Everett 308lbs. Post loads to comments. Austin and power cleans at BU CrossFit. "How to: Drive on a Frozen Lake, Build an Igloo, Heat Your Driveway" by Bob Parks, Wired. Josh Everett 0:35-0:46, Kristan Clever 0:41-0:48 (80lbs), Rebecca Voigt 0:49-0:53 (80lbs), Pam Eamranond 0:55-1:31 (80lbs). Post fastest and slowest rounds to comments. Richard Strauss, Don Quixote with Yo Yo Ma, Part 1 (with interview),Part 2, Part 3, Part 4, Part 5, Part 6. Virginia Woolf - The Mark on the Wall. "Eight Lessons from the life and work of Jack LaLanne" by Seth Godin. "Bureaucracy by Ludwig von Mises (1944) Section 5" by Ludwig von Mises. Kristan Clever 8:48, Kevin Montoya 9:29, Brandon Pastorek 10:36,Michelle Benedict 13:01. 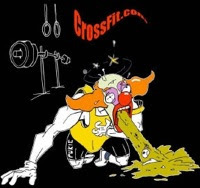 The CrossFit Games Open begins March 15th! "The trouble with fighting for human freedom is that one spends most of one's time defending scoundrels. For it is against scoundrels that oppressive laws are first aimed, and oppression must be stopped at the beginning if it is to be stopped at all." Kevin Montoya 9:13, Kristan Clever 13:21, Pam Eamranond 21:56,Rebecca Voigt 27:11. "Sanity is not statistical -- Being in a minority, even a minority of one, did not make you mad." Jake Rubash 247lbs, Josh Everett 245lbs, Michael Giardina 243lbs,Brandon Pastorek 243lbs, Brandon Phillips 235lbs, Rob Miller 225lbs,Kristan Clever 155lbs, Katie Hogan 155lbs, Rebecca Voigt 120lbs. Mike and today's WOD at BU CrossFit. "The U-bend of life: Why, beyond middle age, people get happier as they get older", The Economist. Post number of rounds completed. Val enjoying another WOD at BU CrossFit. Ashwin Natarajan and Chloe, USDAA trial, Tempe, AZ. "I believe there are more instances of the abridgment of freedom of the people by gradual and silent encroachments of those in power than by violent and sudden usurpations." Samuel Barber - Violin Concerto 1st movement, 2nd movement, 3rd movement. Vladimir Nabokov - The Word. "Why Our Best Officers Are Leaving" by Tim Kane, The Atlantic. Josh Everett 4:21, Kristan Clever 5:30 (95lbs), Brandon Phillips 5:39,Brandon Pastorek 6:21, Travis Holley 6:30, Lance Cantu 6:34, Candice Ruiz 7:42 (95lbs), Rebecca Voigt 7:58 (95lbs), Katie Hogan 11:45 (95lbs). 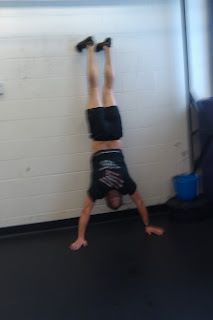 "If everybody is thinking alike, then somebody isn't thinking"
Mike doing Wall Walks, everyone should try this. Henry Wadsworth Longfellow - The Musician's Tale; The Saga of King Olaf. "Why Chinese Mothers Are Superior" by Amy Chua, The Wall Street Journal. Michelle Kinney 5:52 with 115lbs, Kim Malz 6:41 with 115lbs, Michelle Benedict 7:01 with 105lbs, Kristan Clever 8:55 with 160lbs, Rob Orlando 9:07 with 230lbs, Rebecca Voigt 10:58 with 155lbs. 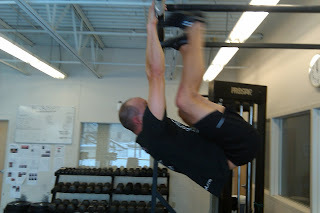 Mike hanging around BU CrossFit.